There are fewer than ten people in this world who have accomplished the Fuego y Agua Devil’s Double Challenge, the completion of two races, a 100 kilometer (62.1 miles) ultra-run and an 85 kilometer (52.8 miles) survival race up and down the sides of two volcanoes with only thirty hours of rest between the events. This February in Nicaragua, Red Rush Athlete Mark Wheeler became one of those people. To race in the Fuego y Agua Survival Run, you can’t just show up. You have to apply or be invited. Some of the top obstacle course racers and ultrarunners in the world were invited to try this thing. Out of forty-three battle-tested athletes Mark finished third. Only three crossed the finish line. At fifty, Mark is the oldest person in history to do so. He used Red Rush the entire time. The Fuego y Agua Survival Run differs from an obstacle course because it demands that the runners adapt to the environment, culture and location. All of the challenges are based on activities that the islanders do like harvesting and carrying bamboo. At one point during the race, Mark hauled a gunny sack filled with five gallons of sand and gravel up the side of a mountain. The contents of the sack were emptied out and were used to make concrete for a sustainable farm. Based on a Polynesian rite of passage, the first challenge the Survival Run racers were tasked with was the retrieval of an egg from a small, unnamed island. Before a racer could attempt any of the latter challenges, they had to present the unbroken egg to the judges. If their egg broke, they had to find another one. Mark only broke his egg once while buying supplies from a boy manning a food stand. The boy sold Mark a new egg— in accordance with the rules all racers carried 500 cordobas and could barter with locals for food, water and eggs—and Mark was able to continue the race. Other challenges included building a raft, harvesting plantains, carrying or rolling boulders away from arable soil, assembling a slingshot, diving for slingshot components and a blistering jaunt up the barren and steep slope of an active volcano. During the cold, nighttime swim across the caldera in the mouth of a dormant volcano, Mark became so chilly that he began to shiver uncontrollably, and he feared that he might be hypothermic. One racer saw Mark’s poor condition and quit right then and there. Undaunted, Mark wrapped himself in a blanket and allowed the tropical air to warm him up. He completed his quest, an unbroken egg in his pocket. Read the extended interview here. Ralph Peterson of Portland, North Dakota retired from his job as a school bus driver after twenty-two years. He still owns and operates Ralph’s Sharp Shop, an outdoor power equipment sales and service business and raises delicious organic sweet corn, the kind that melts right off the cob. He spends free moments with his ten grandchildren and other members of his family. If Ralph’s life didn’t sound idyllic enough, he recently promoted to Blue Diamond Director. His journey started painfully in 1989. Ralph had trouble walking due to the arthritis in his knees. In fact, doctors had told him that he would probably have to have them replaced one day. A friend and future sponsor, AIM Director Wendell Berg noticed this and gave Ralph an entire jar of barley grass with the caveat that Ralph would use all of it. Two weeks, later his knees stopped hurting. Twenty-five years later, Ralph still uses the same knees that he was born with. When he’s working on his AIM business, Ralph is making and receiving phone calls or preparing and sending out information packets, datasheets, books and literature. He places the Healthy Cell Concept brochure and two books—Cleansing the Body and Colon for a Happier and Healthier You: Using Herbal Fiberblend by Teresa Schumacher and Toni Lund and the Nutrition that Works testimony book by Charlotte Thompson—in every packet he sends out. He tells new Members to study and learn what each product does, to get in contact with their upline or someone who will help them and to attend meetings, events, teleclasses and webinars. He also recommends that people attend AIM Conferences. 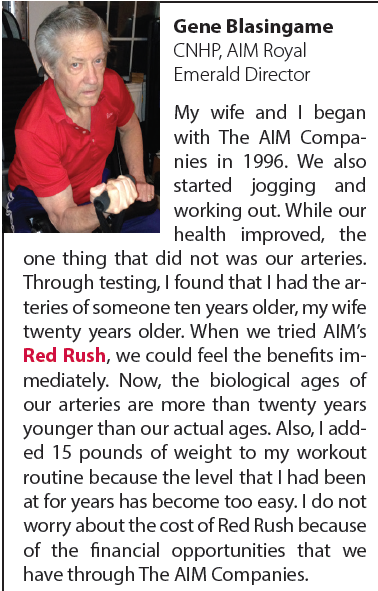 Ralph says he has been blessed to attend the annual Conference nearly every year since joining AIM. He sat next to Chairman’s Club Director Ken Huxter. Hearing Ken’s story motivated Ralph. “I thank God for His constant goodness to me and for providing The AIM Companies™ as a continual source of His blessing in my life. My wife, Phyllis, was a great support to me. I would not be where I am today without all her hard work. She is missed much. Thank you to my children and their families for their love and support. I’d like to thank my downline and the AIM owners and staff. 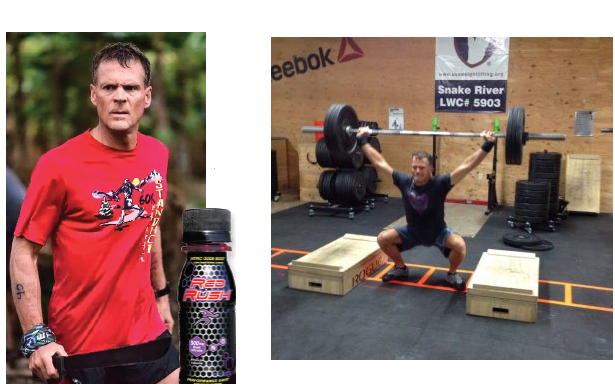 By now, every AIM Member is aware of the athletic benefits of beet juice. 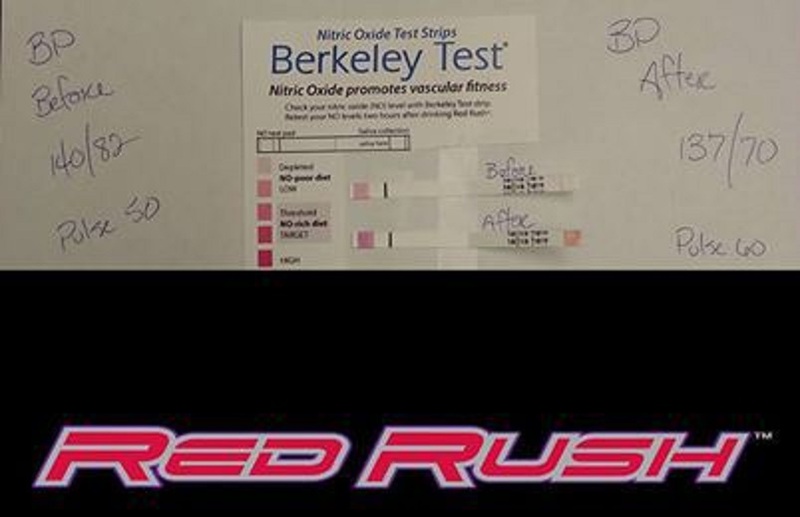 We all know that Red Rush provides a boost of much needed stamina to competitive athletes and helps them recover quickly from their grueling workouts. However, the athletic benefits are just the beginning. Did you know that there have been over sixteen studies that have shown that beet juice can lower blood pressure? The most recent one found that the blood pressure benefits of daily beet juice consumption lasted for two weeks after the subjects stopped drinking the juice. In a recent study, participants who drank beet juice saw an 8/4 mmHg reduction in blood pressure, a 20 percent improvement in blood vessel dilation and a 10 percent reduction in arterial stiffness. One study found that beet juice consumption made walking twelve percent easier, and recently, scientists at Kansas State University have been giving beet juice to heart failure patients in order to help get them mobile again, a critical factor of their recoveries. Nitric oxide facilitates sleep, and due to improved blood flow, it may assist the brain in achieving essential rapid eye movement (REM) sleep. 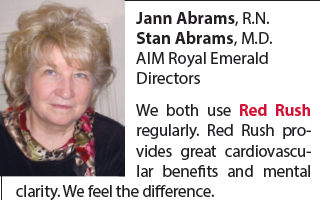 Healthy circulation improves skin quality and keeps the extremities nice and warm. When the circulatory system is working well, the body can repair itself faster by moving white blood cells, nutrients, medicine and platelets to the affected areas. Nearly 90 percent of erectile dysfunction can be linked to poor circulation, and there is some evidence that a percentage of female sexual dysfunction is related to improper blood flow. When the cabin pressure lowers, so does the oxygen in your blood. Beet juice has been shown to improve oxygen utilization, allowing people to get more use out of less oxygen. 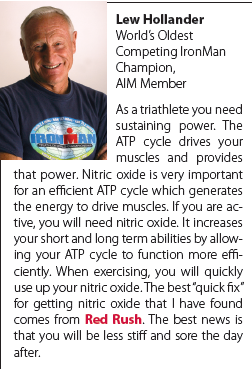 Having sufficient amounts of nitric oxide can really energize the body. Additionally, one of the biggest symptoms of poor circulation is fatigue. 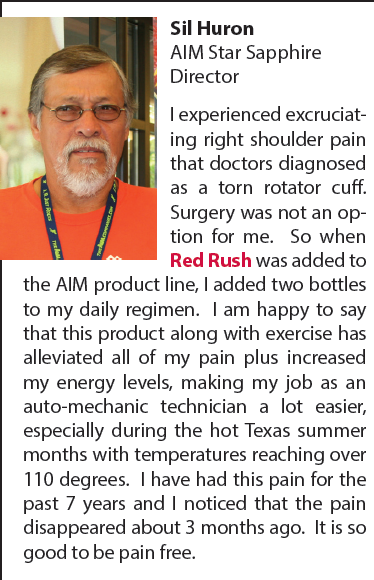 Red Rush can provide natural energy. Gluten is a sticky issue these days for many people, especially for those who react poorly to its presence in foods they consume. From the Latin word meaning glue, gluten is a protein composite found in several grains including wheat, rye, and barley. Because barley plants mature into grain, AIM receives regular queries about gluten and BarleyLife. When you think of gluten, you really have to think of those mature grains of barley not the vegetable-like blades of grass. The young barley plants that provide BarleyLife nutrition are harvested before reaching the first joint that begins the long, transitional phase of growth into grain. However, the embryonic grain in a barley seed can account for a minute amount of gluten in the harvested grass. This is why AIM has been randomly testing BarleyLife for the presence of gluten since 2002. With the explosion of gluten-free foods in the marketplace and the growing gluten awareness of even those without sensitivities, The AIM Companies™ wants people to know that in 2014, nearly 90 percent of BarleyLife contained less than 20 parts per million (ppm) of gluten, which is the standard for a food to be labeled “Gluten-Free.” The remaining 10 percent of powder produced tested between 21 and 28 ppm. People with celiac disease or gluten intolerance should avoid eating foods that contain greater than 20 ppm of gluten. To produce a test result of 20 ppm, a typical 100-gram serving of a food would still contain 2,000 mcg of gluten. A 4-gram serving of BarleyLife with 28 ppm has only 112 mcg of gluten. That’s 42,000 times less than the 4,800,000 mcg of gluten in one slice of whole wheat bread! This is why the majority of people with celiac disease and gluten intolerance have been able to enjoy the many health benefits of BarleyLife without having any issues. 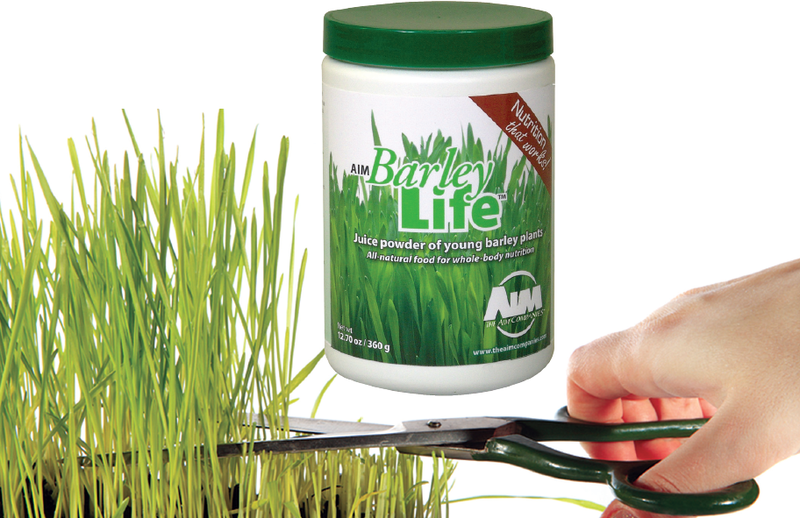 At the same time, those with gluten sensitivities should begin with a quarter serving or less of BarleyLife to test their body’s acceptance of the juice powder of young barley grass. The “free-radical theory” of aging got a significant boost to its scientific paradigm this month when scientists from the The Scripps Research Institute were able to pinpoint how the aging process hampered the production of new immune cells. Their research went on to suggest that dietary antioxidants diminished the damage caused by aging. This is the first study to reveal the mechanism between proper immune system functioning and antioxidants. Their findings were published in Cell Reports. The researchers were interested in discovering what happened to the thymus, the lymphoid organ where T cells are produced, during the aging process. The overall prognosis was not good. The thymus begins its decline and loss of function during early adulthood. Now they think they know the reason why. There are two types of cells in the thymus: stromal (connective cells) and lymphoid cells (innate immune cells). The stromal cells were found to be deficient in catalase. Cells utilize catalase to breakdown hydrogen peroxide, a normal but somewhat dangerous byproduct of the metabolic processes. (Some believe that a lack of catalase and the prevalence of hydrogen peroxide is the reason why our hair turns gray as we get older; it’s literally our hair being bleached from the inside out). So when cells lack catalase, they get damaged by those reactive oxygen byproducts like hydrogen peroxide. So, then the researchers increased the level of catalase in genetically engineered mice and that increased the functioning of their little mousy thymuses. Additionally, the rodents who were given dietary antioxidants like vitamin C maintained proper thymus functioning longer, lending support to the “free-radical theory” of aging. The scientists hope that these findings will lead to improved immune system therapies for the elderly. While many of the AIM products contain vitamin C and other natural, dietary antioxidants, Proancynol 2000 provides seven antioxidant rich ingredients–grape seed extract, rosemary leaf extract, green tea leaf extract, N-acetylcysteine, lycopene, alpha-lipoic acid and selenium–in every capsule. Women, you know that keeping your senses about you in a chaotic world is a challenge. It would be great to have supplemental brain power at your fingertips. From the time you’re young enough to collect thoughts right on through the more mature stages of life, you are bombarded with too much information. Time can take a toll on a jam-packed memory. Taking AIM GinkgoSense can help a lady to stay smart and sharp in spite of it all. GingkoSense is about improving circulation through- out the body, and optimal blood flow is vital for the brain. Your brain is at the center of all body activities, whether thoughtless—balancing, breathing, digesting, etc.—or thoughtful, such as trying to remember the name of that movie actress starring in that film you enjoyed but can’t remember the title of either. Your brain is hard at work all the time, even while you sleep so it requires an awful lot of cellular energy, which, of course, comes from your nutritional intake. And it gets to the brain via blood circulation which GinkgoSense enhances with its blend of ginkgo biloba, bilberry, marigold extracts and DHA. It is very important to carefully think about the kind of nutrition you circulate to your brain. Is yours a French-fried, cake-headed, soda-drenched burger brain or a whole-food nourished mind? It makes a huge nutritional difference to your control center, let alone the rest of your body. 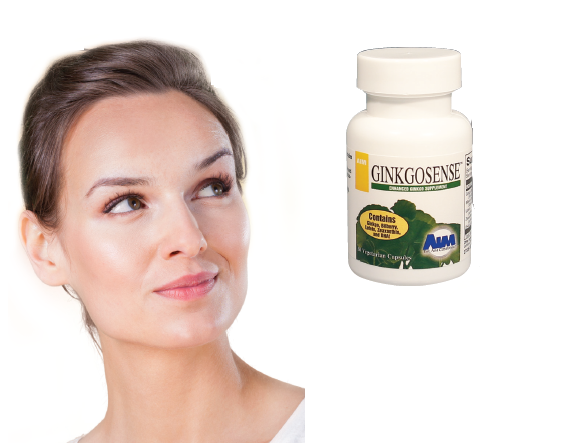 The main ingredient of the GinkgoSense formula comes from the leaves of the ginkgo biloba tree, the standardized extract of which contributes a circulatory boost that can improve brain function, memory, concentration, and overall mental clarity. Just what a woman needs in a demanding world. P.S. You can tell the guys it will work for them just as well. Back in the 1960s, menopause was defined as a deficiency disease by gynecologists, and hormone therapy was the cure. Often referred to as the “change,” “one of nature’s mistakes,” or “a sign of aging,” negative attitudes about that phase of female life blossomed. Such determinations have no reasonable place in the world we live today and should be forever discarded like bell bottom pants. In reality, this natural transition in a woman’s life is an individual experience. Some women undergo numerous symptoms either physical, psychological or both. However, others experience few or none of the stereotypical menopause symptoms. Whatever the circumstances, it can and should be embraced as a new beginning in a lifetime of experience. At the same time, if there are some bumps in the road in the form of hot flashes, night sweats and mood swings, there is natural help for both the possible symptoms of menopause and fear of the aging process. Herbs can be natural friends to women experiencing menopausal symptoms. AIM RevitaFem provides a potent 8-ingredient combination that helps to balance out-of-whack hormones, calm mood swings, cool hot flashes and deliver tonics for the blood, uterine and urinary tract. It is especially fascinating that some of the herbs offer beneficial estrogen-like effects (e.g., red clover, soy extract, black cohosh, dong quai), preventing estrogen from attaching to cell receptors and causing damage. Some act as gentle adaptogens that the body uses as needed to help adapt to and recover from the stress of menopause. For centuries, many of these herbs have been used individually as medicinals for women. 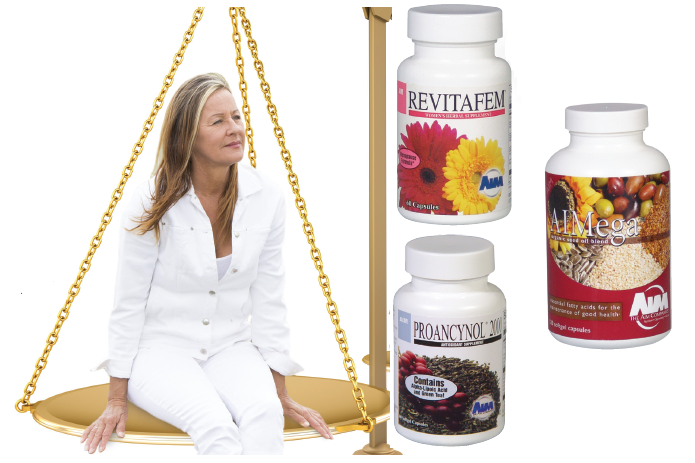 RevitaFem’s botanicals are made more effective by bringing them together in one formula. The lignans in flax seed also provide effective estrogen-like effects, so AIMega gives a girl even more natural help at the menopausal stage in her life. The whole truth is that omega-3 and -6 essential fatty acids (EFAs) are essential throughout a woman’s life. Even though the body cannot makethese healthy fats, EFAs are required daily for a myriad of actions, including brain function (definitely a mood booster), healthy skin and hair growth, weight loss (sometimes difficult during menopause), bone building (estrogen deficiency can cause bone loss) and hormone production (’nuff said). AIMega’s encapsulated organic seed oils make it easy to get the essential fats a woman needs daily, perhaps even more so in the transitional years leading to blossomed maturity. If menopause is a sign of getting older, then a strong antioxidant defence against the damaging effects of free radicals can help prevent the signs of aging. Unfortunately, the body produces fewer antioxidants as the years go by. Along with eating a variety of fruit and vegetables, one of the best ways to increase both the number and variety of antioxidants is to take AIM Proancynol 2000. 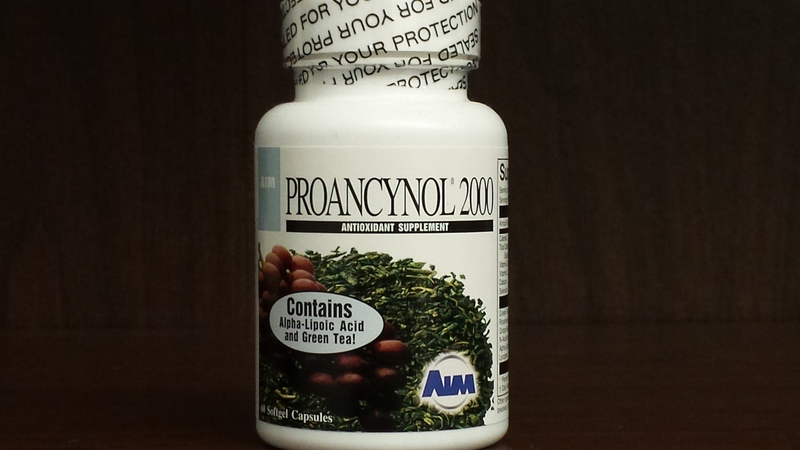 Each capsule of Proancynol 2000 delivers seven antioxidant-rich ingredients: green tea leaf extract, rosemary leaf extract, grape seed extract, N-acetylcysteine, lycopene, alphalipoic acid and selenium. Along with anti-aging benefits, this wealth of antioxidants boosts the immune system throughout stressful changes, and a woman can use all the healthy help she can get. Menopause is a natural process, so balance your chemistry naturally to stay healthy and youthful. While each woman is unique and symptoms may seem overwhelming, it is important to remember a solution awaits with experimentation. Along with dietary adjustments, this trio of natural supplements can help you gain control and balance your body chemistry, giving you a fresher, younger perspective for this new beginning in life.